Ever since a small amount of damage was observed on Robert ‘Beamer’ Curbeam’s EMU gloves during post flight checks after STS-116, NASA engineers have been creating ingenious modifications to improve the safety of their spacewalkers – the latest of which will debut on STS-126. Endeavour’s mission next month will focus heavily on EVA work on the troublesome starboard SARJ (Solar Alpha Rotary Joint) – which will be reviewed in an article later this week. The modification process resulted in the “Glove TMG (Thermal and Micrometeoroid Garment) Protective Patches” – which took over from the opening protective solution of the Overglove. The TMG Glove gave added protection against cuts, without restricting dexterity of the spacewalker during complex tasks, as seen in a major update to the gloves ahead of STS-124. 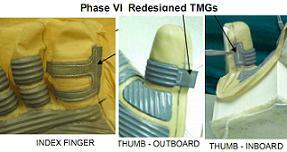 This TMG modification has been improved once again for STS-126, with a special additional patch of “Turtleskin” being included in the glove design – as overviewed in the EVA Flight Readiness Review (FRR) presentation for STS-126 (All 16 SSP FRR presentations available on L2). “STS-126 Prime Flight Gloves will be the first flight of the redesigned Glove TMGs,” noted the presentation. “(This will) improve cut resistance of the TMG (via) a Turtleskin reinforcement layer (which has been) sandwiched between molded palm and RTV (coating) on thumb and index finger, and the implementation of new RTV. Known as the Phase IV modification to the EMU gloves, STS-126’s spacewalkers Heide Stefanyshyn-Piper, Stephen Bowen and Robert Kimbrough have all been trained in the NBL (Neutral Buoyancy Laboratory) with improved gloves. “Redesigned Phase VI TMGs: Confidence for Flight. STS-126 CMs Piper and Bowen have been training in redesigned TMGs since May. STS-126 CM Kimbrough since mid-August,” added the presentation. “Test Experience: Design verification testing conducted at ILC Dover (Completed 34 equivalent EVAs of cycling). Testing included manned cycling, TMG installation/removal cycles and periodic inspections (after every 3.5 EVAs of cycling). As seen in a special PRCB (Program Requirements Control Board) presentation last week, the precautions against cut EMU gloves are of paramount importance to NASA, even after several issue-free missions. The biggest concern relates to the potential of a spacewalker inadvertently cutting his/her glove on a sharp edge during an EVA – a risk when the area has not been previously documented. Such a scenario – known as “Cause C” (Sharp Edge Exposure) – is a real risk due to possibility of a MMOD (micrometeoroid/orbiting debris) strike on the International Space Station (ISS) that results in – for example – a handrail becoming damaged. “Post STS-116 inspection of the EMU gloves revealed delamination of the RTV and cut in the underlying vectran weave. Since STS-116 there have been three more instances cuts to the EMU gloves, one resulting in EVA termination (STS-117 EVA-3),” noted the PRCB presentation. Ever since, the documented risk to a spacewalker has been classed as “Infrequent/Catastrophic” – but thanks to the latest modification, the presentation confirms this risk has now been officially reduced. “Along with the inspections and termination criteria, the phase VI glove have been hardened against sharp edges with the application of Turtleskin patches in the areas of concern (Glove Patch – First flight STS-124. Redesigned TMG – First Flight STS-126. “As part of the transition of Safety paper from the Shuttle program to the ISS program Hazard Report was updated to take credit for the Glove Patch and the Redesigned TMG. As part of the extensive test process to be able to reduce the risk, engineers simulated MMOD damage to ISS hardware on the ground at the White Sands Test Facility, with the objective to see how much abuse the new gloves would need to suffer against a cut handrail before they became damaged. 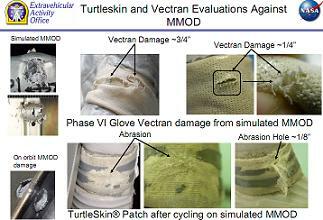 “Objective: Evaluate and compare damage created by simulated MMOD hits on handrails to knit Vectran and Turtleskin. WSTF shot handrails with hypervelocity particles simulating on orbit impacts,” noted the presentation. With the purpose to actually damage to the glove, the key results showed that damage could only be caused when the glove was used “out of family” from what is expected on orbit – meaning the spacewalker would remain safe. “Phase VI Glove Knit Vectran (Molded Palm) Results: Subject was not able to cut the Vectran with slow high force gripping motions. Subject cut Vectran using a quick sliding motion across the MMOD impact site while pushing into the handrail. “TurtleSkin Patch Results: Attempted to cut the TurtleSkin using the same motion that cut the knit Vectran. One attempt broke off a large burr that caused a small cut in the knit Vectran. No damage beyond surface abrasion and RTV loss (after 10 attempts on each glove). The results show that the spacewalker will likely to remain safe from cut gloves, even if he/she accidentally contacts an area of handrail that has been damaged by MMOD – meaning STS-126’s EVAs have added safety in-built, thanks to extensive support from pre-mission testing.